[205 Pages Report] The agricultural robots market is expected to grow from USD 2.75 Billion in 2016 to USD 12.80 Billion by 2022, at a CAGR of 20.71% between 2017 and 2022. The increasing focus on farm-efficiency and productivity is expected to propel the growth of the agricultural robots market. The base year considered for the study is 2016 and the market size forecast is provided for the period between 2017 and 2022. 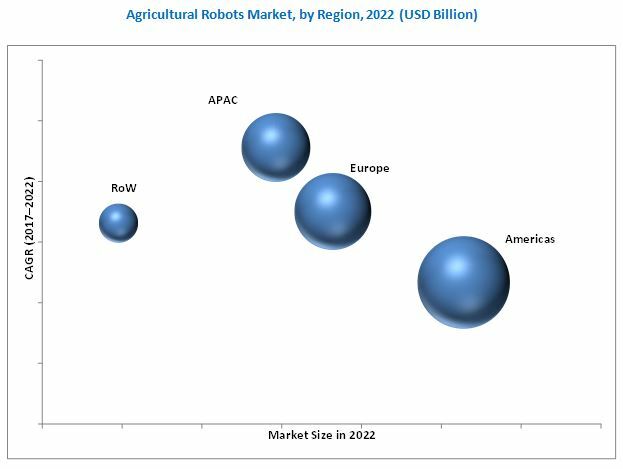 The research methodology used to estimate and forecast the agricultural robots market begins with capturing data on key vendor revenues through secondary research. Some of the secondary sources include associations such as European GNSS Agency (GSA) (Czech Republic), International Federation of Robotics (Germany), British Automation & Robot Association (U.K), Israeli Robotics Association (Israel), CropLife (CropLife Media Group) (U.S.), and Agricultural Research Organization (Israel). The vendor offerings have also been taken into consideration to determine the market segmentation. The bottom-up procedure has been employed to arrive at the size of the agricultural robots market from the revenue of the key players in this market. After arriving at the overall market size, the total market has been split into several segments and subsegments, which have been verified through primary research by conducting extensive interviews with key experts such as CEOs, VPs, directors, and executives. The data triangulation and market breakdown procedures have been employed to complete the overall market engineering process and arrive at the exact statistics for all segments and subsegments. The breakdown of the profiles of primary respondents is depicted in the following figure. The agricultural robots ecosystem includes augmented or managed service providers such as Deere & Company (U.S.), Trimble, Inc. (U.S.), and Leica Geosystems (Switzerland); component manufacturers such as Deere & Company (U.S.), Trimble, Inc. (U.S.), and AJ Junction, Inc. (U.S.); device vendors; tractor manufacturers; farm management solution and application providers; and end users. Detailed analysis for UAVs, milking robot, automated harvesting robot, and driverless tractors. Detailed analysis of various hardware, software, and services for each country. 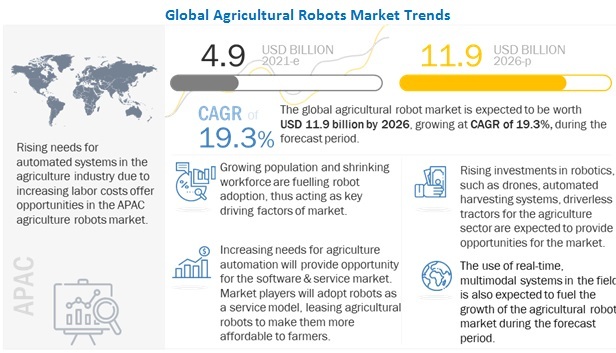 According to MarketsandMarkets’ forecast, the agricultural robots market, in terms of value, is expected to grow from USD 2.75 Billion in 2016 to USD 12.80 Billion by 2022, at a CAGR of 20.71% between 2017 and 2022. The major drivers for the agricultural robots market include the adoption of new technologies to increase farm efficiency and reduce production cost, increasing global demand for food owing to increasing population, increasing need for monitoring crop health for yield production, and the government’s support for adoption of modern agricultural techniques. This report covers the agricultural robots market based on offering, type, application, and geography. The harvesting management application is expected to hold the largest share of the agricultural robots market between 2017 and 2022. Harvesting management is the most widely used application in agricultural robots as it plays a vital role in understanding the field variability and helps farmers in maximizing their yields. Increasing labor cost is motivating farm owners to adopt automated harvesting system. Automated harvesting management held the largest market share among all applications due to the high adoption rate among farmers and growers. The agricultural robots market for the services segment is expected to grow at the highest rate between 2017 and 2022. The market for services is segmented on the basis of five broad categories system integration and consulting, managed services, assisted professional services, connectivity services, and maintenance and support. The increasing demand for managed and assisted professional services is the major reason behind its high growth rate. The agricultural robots market for driverless tractor is expected to grow at the highest rate between 2017 and 2022. The market based on type is divided into unmanned aerial vehicles (UAVs), milking robots, automated harvesting systems, and driverless tractor. The adoption rate of driverless tractor is expected to increase during the forecast period because this technology helps in applying the right amount of input at the right place on the field, which minimizes the input waste and increases the productivity of the land and crop. The Americas held the largest share of the agricultural robots market in 2016. The demand for advanced agricultural solutions is expected to drive the growth of the market in this region. Farmers or growers in this region are increasingly adopting advanced farming systems and equipment such as steering and guidance systems, sensors, display devices, and farm management software. The agricultural robots market in APAC is expected to grow at the highest rate between 2017 and 2022. The major challenges for the companies in the agricultural robots market are management of data for productive decision and lack of standardization. The major vendors in the market include Deere & Company (U.S.), AgJunction, Inc. (U.S.), and AGCO Corporation (U.S.), DJI (China), Lely Holding S.A.R.L (Netherlands), and Agribotix LLC (U.S.). These players adopted various strategies such as new product developments, mergers, partnerships, collaborations, and expansions to cater to the needs of the customers. 12.10 Topcon Positioning Systems, Inc.